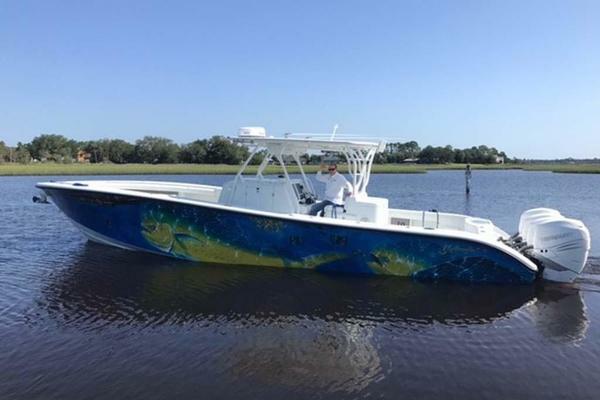 Yellowfin Boats first began building high-end fishing center-console boats back in the late 1990's and has not stopped pushing the industry forward. From the Yellowfin bay boats to larger Offshore Series, there is a model to fit any budget and need. Let the team at United help you find the right used Yellowfin boat on the market for you. 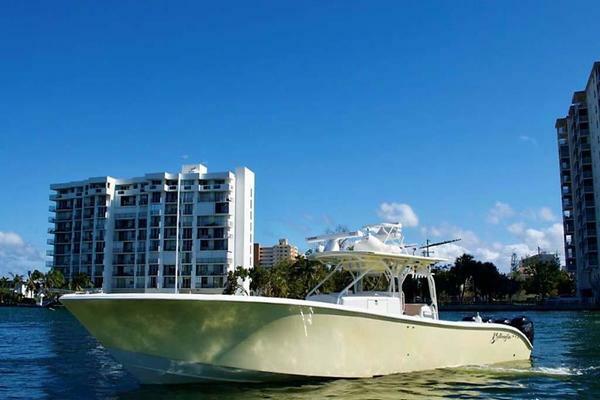 Yellowfin Boats began in 1998 and are the leader in builders of top quality center console boats. Yellowfin boats are stable, dry rides with ultimate fishability and performance. 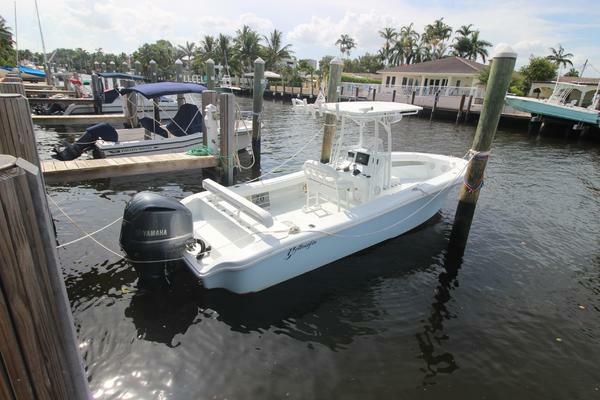 Yellowfin Boats are located in Bradenton, Florida and feature a number of superior fishing models for every fisherman’s needs from a 17’ Skiff to a 42’ Offshore Fisherman. Each Yellowfin is a high-performance fishing platform custom built of the highest-grade materials and products, all skillfully assembled in Florida but proudly proclaim their Outer Banks origins, with high bows and wide flare. The 24 Bay is designed with years of inshore and offshore experience, the overall ergonomic layout of this boat suits both family and tournament angler alike. Fuel Capacity: 72 Gallons; Length: 24’10”; Beam: 8’6”; Draft: 14”; Weight: 3,050 lbs. ; Power: Single Outboard (400 HP Max-Verado Only). Yellowfin introduces a carbon fiber weave which was specifically made for the 24 Bay and the combination of 100% vinyl ester resin and resin infusion, they were able to reduce the weight by 25%! This gives the 24 Bay a shallower draft, better fuel economy and a faster top end. This new layout comes with a built-in fish box/cooler and a forward step up to the front deck enabling anglers easy access. 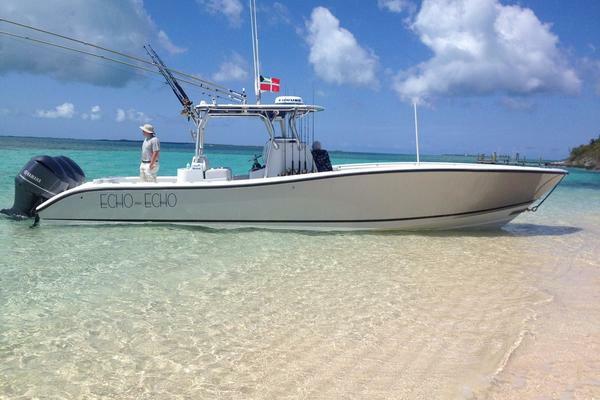 The 24 Bay CE is a speedy and spacious bay boat that isn’t afraid to go shallow. Yellowfin changed the deck layout. The Carbon Elite incorporates a forward 5” step for easier access to the front casting deck. Below that step hides a giant 290-quart fix box that drains overboard to the reach and can be rigged with a macerator pump. In addition, 3 compartments provide ample room for organized storage of gear and safety equipment. Fuel Capacity: 72 Gallons; Length: 24’10”; Beam: 8’6”; Draft: 14”; Weight: 2,400 lbs. ; Power: Single Outboard (400 HP Max-Verado Only). The 26 Hybrid is a combination of the best features of the larger offshore center console with many features of the bay boats. The 26 Hybrid is the ideal boat for the fisherman that needs one boat to do it all. This Yellowfin has a higher shear and freeboard than bay boats, but still lower than center consoles. She has a lot of fishing room with a clean one-level deck that makes it easy to get around. Fuel Capacity: 118 Gallons; Length: 26’; Beam: 8’8”; Draft: 16”; Weight: 5,000 lbs. ; Power: Single or Twin Outboard (400 HP Max). The 29 Offshore is a perfect light-tackle fishing platform with plenty of storage areas, spacious livewells and 360-degree walk-around space. Fuel Capacity: 224 Gallons; Length: 30’11”; Beam: 9’6”; Draft: 18” (loaded); Weight: 7,400 lbs. ; Power: Twin Outboard (800 HP Max). The 32 Offshore has been described as the “sports car” in the Yellowfin line. The 32 tracks and cuts waves better than most much larger center consoles yet provides handling like what you would expect from a high-performance skiff. Fuel Capacity: 332 Gallons; Length: 32’6”; Beam: 9’9”; Weight: 8,200 lbs. ; Power: Twin Outboard (800 HP Max). The 34 Offshore is a live-bait fisherman’s dream with a 55-gallon transom live well and options of an additional 55-gallon floor well, for maximum bait-keeping ability. The forward seating options and choice of consoles and leaning posts make the 34 the perfect boat for the family who is serious about fishing.  Fuel Capacity: 419 Gallons; Length: 34’8”; Beam: 10’; Weight: 8,800 lbs. ; Power: Twin or Triple Outboard (1,250 HP Max). The 36 Offshore has dominated the Southern Kingfish Association and other tournament events for over a decade. 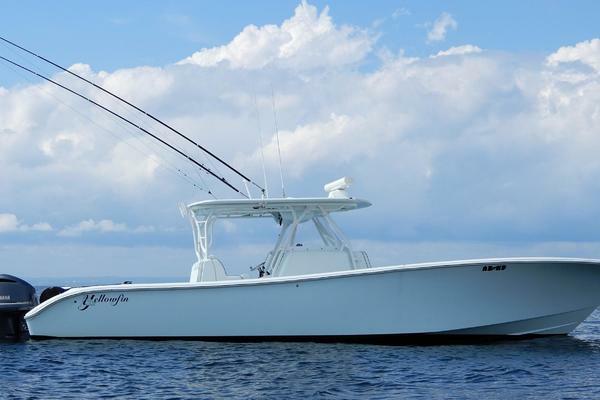 Several consoles, leaning posts & top options let you customize this 36 Offshore to compliment your fishing style. Fuel Capacity: 477 Gallons; Length: 36’8”; Beam: 10’; Weight: 9,500 lbs. ; Power: Twin or Triple Outboard (1,250 HP Max). The 39 Offshore is built for ultimate performance when the weather isn’t cooperating. It comes with all the storage space you will ever need. It features a stand-up head and shower and is functional at fishing as well as entertaining. Fuel Capacity: 564 Gallons; Length: 39’8”; Beam: 11’6”; Weight: 13,000 lbs. ; Power: Triple or Quad Outboard (1,650 HP Max). 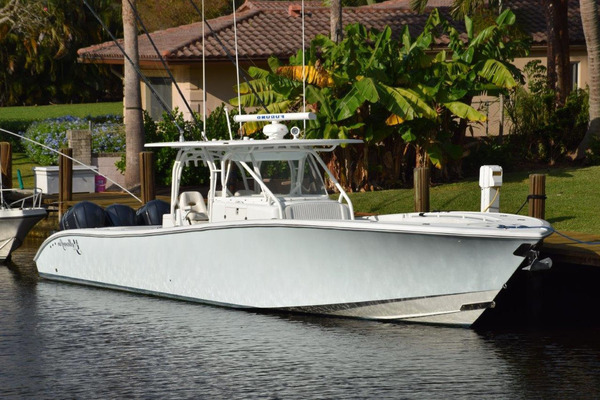 The 42 Offshore can run circles around big diesel inboards in a Marlin Tournament, while burning a fraction of the fuel, but is equally at home competing in a local KDW competition. Whether you are seeking a large family boat for weekend excursions or a full-on tournament ready boat, the 42 easily accommodates both duties. Tackle storage is generous and there are 14 rod holders wrapping around the console sun pad alone! There is a trio of insulated in-deck fish boxes. Nothing else compares in the market today. Everyone will be envious of the super-sleek gel coating and dual berth and head with shower. Fuel Capacity: 571 Gallons; Length: 42’; Beam: 12’; Weight: 15,000 lbs. ; Power: Triple or Quad Outboard (1,650 HP Max). If you are looking for a used Yellowfin or interested in selling your Yellowfin, United Yacht Sales is the best qualified to help you with your boating needs with over 30 years of experience in the yachting industry. United Yacht Sales will provide a strategic marketing plan for your Yellowfin to get it sold. As representing your used Yellowfin, it is our duty to get it sold and do it right. With connections throughout the world there is no doubt United Yacht Sales can find your next Yellowfin. We provide complete worldwide MLS results, provide a network of brokers and industry leaders, and we won’t stop until you have the Yellowfin of your dreams.